I've been in Hong Kong since Feb 2012, a whole 18 months now. I absolutely adore this city and country, more so than I ever thought I would. I have a solid group of friends, I feel that I've grown as a person and I've fallen into the lifestyle with ease. Who wouldn't, with boat trips on the weekend and a beach not more than 20 minutes away?! However, as of June next year, I will officially be a Londoner again! Ras' company have started up a new department and they want him there, so back to Blighty we go! I'm not sure how long we'll be living in London, or where in London we'll be but we will be back. I'm going to be very, very sad to leave Hong Kong and the people in it behind, but the original plan was to stay for 2-3 years and by the time we move back we'll have been here for 2 and a half, so it works out well. I'll be continuing to model when I get back to the U.K, so expect a lot of shiny new images to be appearing soon whilst I get my portfolio ready for my grand return! So some of you may know I'm a huge fan of a Northern Irish rock band called Million Dollar Reload. The best (and most accurate) review I've heard for them is "Sounds like AC/DC, Aerosmith and Guns n Roses jamming in Buckcherry's garage". How could you not want to listen to something like that!? Anyway, I was lucky enough to meet some of them last year backstage (!) at Download Festival and it turns out that not only are they incredibly talented musicians, but they're also thoroughly lovely chaps! So at the end of the day at Download, the guys threw me a new t-shirt advertising their new album and asked if I'd be interested in modelling it for them. I obviously agreed and spent the next few months trying to find a date where myself and my amazing friends Leanne and Joe were available to do the shoot! There are a couple more in the works, but I couldn't resist sharing this with you! So my agency sent me on a job a little while back for a new watch that has just launched. The brand is Cookoo and it seems to be getting quite a lot of press, as it's been funded through Kickstarter (a website where you post your idea and people donate/pledge money, check it out!). What a busy couple of weeks! I flew back to the U.K over Christmas to visit family and managed to squeeze in a few shoots with a selection of people, some with whom I've worked before (the ever wonderful Joe and Leanne - more on them later) and a couple I hadn't (you'll have to wait and see on that front). Visiting my family and friends was wonderful, but I found it harder this time, somehow. Maybe because Christmas is a very family oriented time, so being around them all made me realise just how far away I am. I had a wonderful time though, and got lots of lovely gifts. Everyone seemed to like the gifts I bought them too; I made an effort to buy everybody something from Hong Kong that they may not be able to get in England. I ended my year on the roof of a 20 story building in Dalston, wearing a 3 pointed hat and a drawn on fake moustache, and watching every set of fireworks that London has to offer! It was truly spectacular, the whole horizon (I had a 360 degree view of London) was sparkling with fireworks! 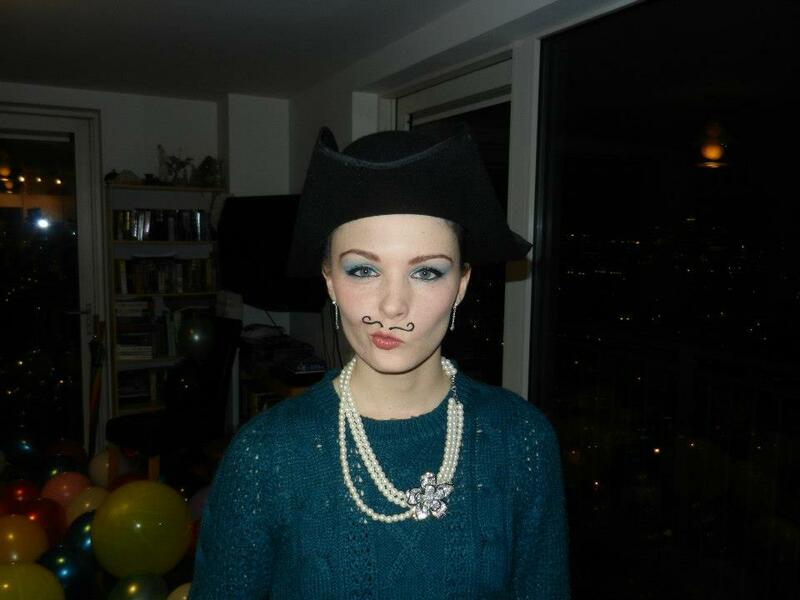 The hat was compulsory for the party, the 'tache was not. I put on the hat and instantly knew it required a moustache! This February will be our first anniversary of moving to Hong Kong (it's gone so quickly!). Ras and I missed our third anniversary in November because he was away with work, so we're planning on rolling Valentines day, our anniversary and the celebration of our first year in Hong Kong into one and heading to the Philippines on a diving holiday. This means the first item of my New Year's resolutions list is to 1) Get my PADI open water diving certificate! I've not got any other specific resolutions this year as I find I never stick to them anyway, but I'm planning on cleaning up my diet (I'm going vegan once a week, veggie twice a week and I'll be trying to eat a lot more fish, a food I really like but never seem to eat). I'm also going to start my strength training very soon, which along with my new diet (it's a lifestyle change, not technically a 'diet' as such), should give my body and mind a real boost toward health-dom! It dawned on me half way through that I'd never actually done a 'proper' lingerie shoot before. Sure, I've done shoots in lingerie, but the lingerie wasn't the focus of the shot, more of an accessory. So I'm pretty happy to be able to add these to my portfolio! The photography is of course, Joe Gascoigne and the hair and makeup was done by Leanne. The lingerie is my own, bought in the most adorable little shop in Hong Kong! I've easily doubled my lingerie drawer with sets from there! I'd really love to hear your opinions on the pictures, as well as your new year's resolutions or even how your Christmas went! I've been neglecting you again. I'm sorry *slaps self on wrist*. I can't even say that I've been hugely busy, certainly not busy enough that I don't have time to sit down and write! However, I have been doing a few things. I've got a Christmas cocktail party coming up (which I'm hosting) and so my last couple of weeks have been spent sorting out the food, decorations, drinks and, most importantly, trying to find the perfect dress to wear! I've got a fitting on Friday with a designer friend of mine so we'll see what she comes up with! I have my friend Anita De Bauch arriving from somewhere in Asia today (I think Singapore, but she could be anywhere; it's her Asia tour, after all! ), so the next few days will be spent spending quality time together, catching up and exploring Hong Kong. We've plans to go and see the Pandas at Ocean Park, and possibly the wild monkeys in Sha Tin (if the weather gives a little), which will be fun. After her Hong Kong trip, she's heading to Bangkok to charge her batteries a little and so I've decided to join her for a couple of days. We're flying out there the same day (different airlines though) and will probably spend the 3 or so days getting massages and manicures and raiding the markets that Bangkok has to offer! Then it's back to Hong Kong for my cocktail party, a week of frenzied Christmas present shopping and flying to the U.K on the 14th to spend time with my family and friends for the Christmas period. It's Ras and my 3 year anniversary today too, but he's in Singapore (of all places!) until Thursday so we've got nothing planned. We do plan on taking a little trip away early next year to somewhere hot and romantic. We're looking at somewhere in Indonesia at the moment. Bliss! As promised, my newest publication! I finally managed to get the scanner to work and produce mostly decent scans of my most recent work with Wedding Magazine, yay! I know I promised to upload them last week but with the scanner not working and then being away in Thailand for a few days (pictures from that holiday very soon! ), I only managed to get around to it today. I'm spending the rest of today going through my holiday photos from Thailand and pictures from my Mum and Step-Dad's visit last week as well as packing for my 2 week trip back to the U.K. I'll be glad when all this travelling is over; I've been on the go for almost a month straight now. As much as I love being in new places and seeing people, sometimes all a girl wants is her nightie, a glass of wine and a good film! This week I have mostly been playing tour guide to my parents, who are here to visit for 10 days. John (my step-dad) had never been out of Europe and Mum had only been to the U.S, never toward the east, so they are both really excited to be here. We've seen the Tian Tan Buddha, Victoria's Peak, they've been to Macau and tomorrow we're going to the 10,000 Buddhas temple and Kam Shan Country Park to see the wild monkeys. It was Mum's birthday the day they arrived and so we took her down to Shek-O beach so that she could paddle in the South China Sea and get sand between her toes <3. It's wonderful having them here, showing them the sights, sounds, tastes and smells of what has very fast become one of my favourite places in the world, and my home. We've been here 6 months now and every so often I do still stop and think "Wow! I actually live in this place. This is my home!". Normally when I'm on the ferry going across the harbour or on a hike looking across the sea and the outlying islands. Now, I promised all of you who have joined me on my Facebook Page that I'd have some new images to share with you tonight. Fear not! My Dropbox folder has been pinging all day and I've finally got the last of them downloaded. They're from my recent shoot with HumbleJim Photography, Albert Chan and Taxi makeup, one image from which I posted in my Model-versary blog a few weeks ago. I had such an amazing time working with those three and sincerely hope we get to do it again some time. Taxi's styling skills are phenomenal - she was the makeup artist, hair stylist and wardrobe stylist for the shoot and, let me tell you, there was no "jack of all trades" going on there! Absolutely brilliant attention to detail and she's wonderfully creative and talented! I absolutely *adore* the emotion in my face here. Like some sort of sad Chinese clown! The bath really was this colour! I hope you enjoy, and please do let me know which one is your favourite! I just can't decide!